JaVale McGee came a long way from being a perennial "Shaqtin' A Fool" candidate to playing a key role on the Warriors' championship run. Now as a Los Angeles Laker, he will become one of LeBron's most valuable assets. When LeBron James signed a 4-year, $154 million deal with the Lakers this summer, many assumed a superstar cast would follow him to Los Angeles. Maybe a Kawhi Leonard trade was in the works, or maybe DeMarcus Cousins would look to rebuild his value alongside The King. Neither deal came to fruition. Instead, LeBron enters 2018–19 armed with a cast of youngsters and former castoffs, highlighted by a free-agent class of Rajon Rondo, Lance Stephenson, Michael Beasley and JaVale McGee. That’s one way to boost James’s candidacy for a fifth MVP. He won’t draw criticism for stacking the deck, with the Lakers’ roster looking less like a dream team than a potential cast for Space Jam 2. A top-four seed in the West will be a significant accomplishment. Reaching the Finals will be a minor miracle. The pieces aren’t totally out of place, though. James spent last season without a capable secondary playmaker, forced to initiate all of the Cavs’ offense without Kyrie Irving. Most Cavs possessions in 2017–18 followed the same pattern: James in a spread-pick-and-roll with a Cleveland big man, barrelling toward the tin or kicking it out to a stationary shooter. LeBron’s brilliance made for a passable offense, but watch the Finals tape against Golden State and you’ll see James exhausted late in games, burdened with the responsibility of creating on every possession. Stephenson and Rondo will shoulder some playmaking responsibility, allowing James to take a lightened load, especially during the regular season. LeBron will assume nominal point guard duties come playoff time, though on winter nights of a back-to-back, Rondo and Stephenson will provide a significant boost. Despite the benefit of bringing in Rondo and Stephenson, the most valuable piece of the Lakers’ non-LeBron additions is McGee. Yes, the JaVale McGee of Shaqtin' A Fool and cinnamon challenge fame, the same player who cycled through four teams in eight NBA seasons before finding a home in Golden State for two years. 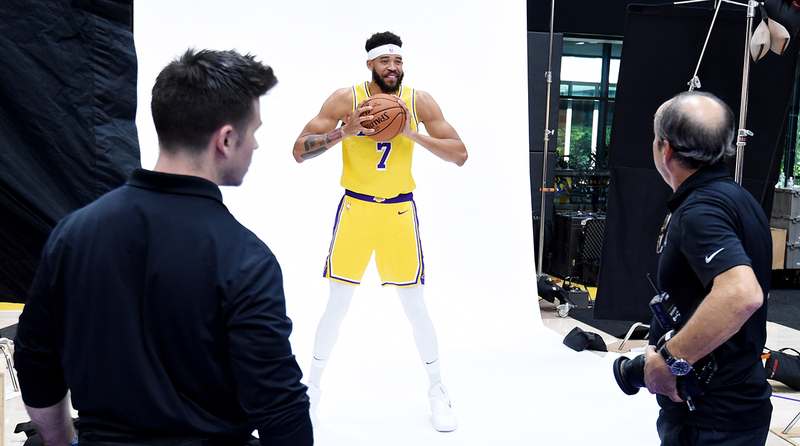 Because while Los Angeles’s backcourt additions can be replaced by Lonzo Ball or Josh Hart, there’s nobody on the roster presently capable of replacing McGee at the five. And although he’s been a headache for a large portion of his career, McGee projects to be the ideal center to play alongside James. McGee won’t need any adjustments from Golden State on the defensive end. He sports an impressive 7’6” wingspan, serving as a quality help defender near the rim. The University of Nevada, Reno, product tallied his highest block percentage since 2012–13 last season, pairing with Draymond Green to form one of the league’s toughest interior duos. McGee isn’t just a simple swatter, either. He developed stronger instincts in the paint with Golden State, and the days of him snoozing behind backdoor cuts seem to be a thing of the past. He isn’t a center who will get dusted when forced to defend on the perimeter, either. He ranked in the 65th percentile as an isolation defender following a switch last season, per The Athletic’s Pete Zayas, allowing just 0.85 points per possession. McGee is lighter on his feet than one would expect, even giving LeBron fits when defending James off of switches in the Finals. He employs his best trick against smaller guards, trailing them on the hip before extending his paw out for a block attempt when they try to sneak a scoop layup. Entering his 11th season, McGee now sports the tactics of a heady veteran. McGee will be asked to fill the Tristan Thompson role alongside James on the other end of the floor. Offseason workout videos notwithstanding, don’t expect McGee to stretch the defense à la Channing Frye. McGee will be primarily used as a screener and rim-runner, spacing the floor vertically instead of horizontally. McGee is an elite athlete with significantly more explosion than Thompson. He’ll quickly become a useful lob target for James and Ball, using his immense wingspan to corral errant passes above the rim. McGee is an impressive leaper on the roll as well as on the weak side, with softer hands than one would expect. He was often the beneficiary of dump-offs from Draymond Green in the four-on-three following a trap of Steph Curry, making the defense pay while in a crowd. That will come in handy as James draws double and triple teams near the paint. McGee’s best trait, however, came in transition, sprinting past opposing centers on the break in Golden State. He should get plenty of free buckets on outlets from Ball and James in Los Angeles. He leaves something to be desired as an offensive rebounder. He doesn’t provide the same interior tenacity as Thompson, and hasn’t shown much propensity to fight for extra possessions. Cleveland often kept pace with Golden State by grinding the shot clock and winning extra possessions on the offensive boards, with Thompson providing crucial second-chance points. McGee hasn’t proven he can replicate Thompson’s effectiveness on the offensive glass, but that may be a function of opportunity rather than skill. He’s averaged 10.2 rebounds per 36 minutes in his career, including 11.9 per 36 for Golden State in 2016–17. An uptick in playing time could add an boost in effectiveness. McGee has proven his playoff chops over the past two years, becoming a key cog in Golden State’s rotation last season. He’s come a long way from his ill-fated Wizards and Nuggets tenures, evolving from a foolhardy kid to a battle-tested vet. It’s been quite the evolution over the past decade. Los Angeles will provide a different kind of spotlight. James is notoriously demanding, and on a one-year deal, McGee could quickly prove expendable if things sour early. But expect McGee to shine with his new franchise. Ivan Zubac and Moritz Wagner won’t be able to replace his length and athleticism, so unless an outside player emerges, McGee will get plenty of time to ingratiate himself with James and head coach Luke Walton. It’s a bit jarring to see after a career previously defined by a stream of foolish mistakes, yet McGee enters 2018–19 as one of the Lakers’ most reliable pieces in year one of the LeBron era.